It was close, but someone ate the pepperonis while I was making said bento. I originally was going to stuff the mini pitas with basil/tomato cream cheese & pepperonis, then add shredded cheese on top. However, the lack of pepperoni and the late hour meant immediate substitutions. Mr. Ben still had his mini pitas stuffed with tomato-basil cream cheese, but he had chunks of mozzarella to go with it and some grapes. Less than exciting, imho, but he was happy with it. I love your Bentos, and while they seem really healthy for the most part, they also always include a lot of cream cheese. I know cream cheese isn't all that unhealthy, but I would think eating that big of a portion, daily, is. Are you concerned with this at all? It's twice a week for bento snacks, and the mini pitas are about 1.5 inches in diameter. I'll measure it sometime, but I think it's between 1-2 tbsp if I fill 2 of them. Per the container, 2 tbsp is 80 calories. For the rolled sandwiches, I use just a thin layer to act as a "glue" instead of margarine. They need something sticky to hold them together and my kids won't eat PB. 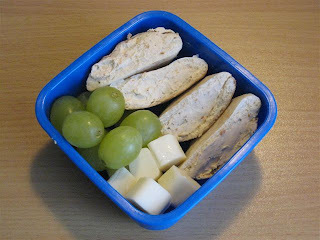 Came across your blog yesterday and love your Bentos! You have inspired me. Where do you find the mini pitas? HI! I came across your blog yesterday and I LOVE YOUR BENTOS!! I didnt know what a Bento was until about 24 hours ago. I made my first one last night for my 6 year old daughter. I cant wait to get home today and see what she thought of it!! I will post it on my Blog today so you can see it!! Thanks for the inspiration! Jen, the mini pitas are "Toufayan" brand. I get them at Kroger in the bakery section. They are about 1.5 - 2 inches in diameter and perfect for stuffing with snacks.